Masahiro Tanaka already had plenty of cards prior to his debut with the New York Yankees. But now that's he's in the majors, many collectors are now on the lookout for his MLB rookie cards. Topps has announced plans for their initial offerings. The first Masahiro Tanaka Yankees card is in 2014 Topps Gypsy Queen Baseball. Besides a base card, he also appears on parallels. 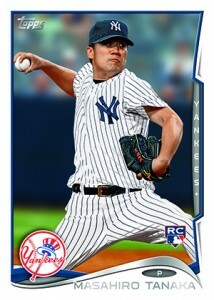 From there, Tanaka will also appear in 2014 Bowman Baseball with another rookie card, parallels and a Mini Chrome insert. In the near future, the Japanese pitcher will also appear in 2014 Topps Archives and 2014 Topps Series 2 Baseball. From there, it's probably safe to assume he'll appear in virtually every Topps product in some form for the rest of the year. Of note, Topps has not announced any Masahiro Tanaka autographs. This includes the various Mystery Redemptions that have appeared in a handful of early-season products. Panini is also including Tanaka in their 2014 products. His first card with the company is a wrapper redemption Rated Rookie from 2014 Donruss. 2007 MASAHIRO TANAKA BBM ROOKIE *CHEAPEST ON EBAY! * FREE SHIPPING!!! 2014 Topps Gypsy Queen Baseball Hobby Box - Factory Sealed!